Borrowing the phrase “caps of metal” from Julian Huxley’s science fiction short, “The Tissue-Culture King,” I use portrait photography and cautionary satire to explore the line between crazy and cool. Through the lens I re-discover foil as a cheap signal blocking technology, a shiny brilliant malleable object, and a potential fashion statement made out of necessity—to secure privacy and information in the digital era. 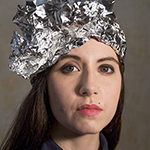 Caps of Metal includes a series of framed portraits of families, friends, and IT professionals designing and wearing their own foil headgear. The portraits are re-used in privacy posters that include statements appropriated from security emails, faraday bag promotional internet sites, and popular journalism. Posters are given away for free at exhibitions, public events, and wheat pasted around Philadelphia.